Blu-ray and DVD Review Round-Up: Films by Fritz Lang, Orson Welles, Jacques Tourneur & more! 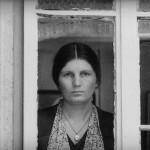 Blu-ray Review Round-Up: Films by Shirley Clarke, Miklós Jancsó, Akira Kurosawa & more! Tomu Uchida (1898 – 1970) was one of Japan’s very greatest filmmakers, but it would not be at all surprising if many regular readers of this site – dedicated movie fans by definition – had never even heard his name. 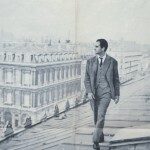 At the recently-concluded Uchida series at New York’s Museum of Modern Art, the most complete retrospective of the filmmaker ever mounted in the English-speaking world, I saw seventeen of his movies, and the experience was magical. The films, only two of which I had seen before, almost all generated enthusiastic applause from audiences at the MOMA screenings I attended. 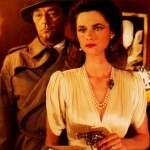 I began to wonder if the situation with this director’s reputation might be analogous to the case of Jean-Pierre Melville, in the period prior to the re-release in New York, in the early 1980s, of his 1956 classic Bob le Flambeur, when American critics suddenly realized that Melville was a very important moviemaker. Could a similar belated discovery be awaiting Uchida? (And are you reading this, Criterion Collection?) In the meantime, his obscurity allows me to do the one thing I love most as a cinema buff: finding a new filmmaker to love and spreading the news to anyone who will listen. We can speculate as to the reasons why Uchida is so little known in the West. His career can be divided very neatly into two halves: a pre-Pacific War period (1922-1940) and a postwar period (1955-1970), with an awkward 15-year gap between them, during which he continually tried but failed, due to the political turmoil of the time, to make even more films. Very little of his prewar work seems to have survived intact and during the postwar period, he was a contract director at Toei, the least prestigious of the six major film studios in the Japan of that era. So it’s not that surprising that Uchida’s films received virtually no international exposure during his lifetime. Uchida was an exceptional film craftsman in an era in Japan in which very solid craftsmanship was almost a given. However, it has been maintained by some that, like many good Hollywood pros, Uchida was an impersonal artist, with no characteristic “personality.” This seems to me completely wrong. I can easily discern, across films of several decades, a number of recurring, indeed obsessive, themes, and his work feels to me very personal indeed. So my mission in this article is to trace these themes in the individual films, and to try to make sense of them in the larger context of his career. 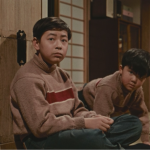 Note: I could not see Uchida’s very rare Dotanba (1957) and, for reasons of space, I’ve decided to exclude from this article the following five Uchida films that I did see: A Hole of My Own Making (1955); The Koroda Affair (1956); The Horse Boy (1957) (a film so obscure it isn’t even listed in The Internet Movie Data Base); The Master Spearman (1960) (which contains a hilarious and subversive harakiri scene); and Uchida’s penultimate film, Hishakaku and Kiratsune: A Tale of Two Yakuza (1968). I am indebted for biographical information on Uchida to Craig Watts’ online article, published for Bright Lights Film Journal, which, despite its brevity, constitutes the most thorough summary of the filmmaker’s life and career I’ve yet read. The story concerns the relationship between intelligent, sensitive Officer Itami and his former friend from his student days, Tetsuo, who now confront each other from opposite sides of the law. 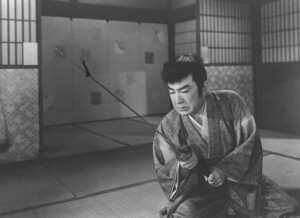 Kurosawa may very well have gotten script ideas for his classic detective film, Stray Dog (1949) from this picture: the sympathetic “villain” who is a kind of mirror image of the hero; the character of the protagonist’s beloved mentor, who is shot by a unknown criminal who then escapes; the alienating atmosphere of the big, anonymous city; the dramatic chase scene at the end. Expressionistic elements are interestingly mixed with the overall gritty realism: a chain-link fence superimposed upon a map symbolizes the police “net” tightening on the criminal gang, and the final chase through the night city is thrillingly abstract, equal to anything Fritz Lang, say, was doing at the time. This work reveals a filmmaker who was already a major craftsman, though Uchida as yet lacks the emotional depth characteristic of an artist in the full sense. This film left me feeling profoundly uncomfortable. An educated young man, Kato (Ureo Egawa), who should be well advanced in his career, plays with the neighborhood children all day because he can’t get a job, and cheerfully calls himself a bum. A young woman (Yukiko Todoroki), the daughter of the film’s middle-aged hero, salaryman Tokumaru (Isamu Kosugi), is mockingly called “95 sen” by the local kids because her daily wage is, indeed, only 95 sen – that is, just short of one yen: not a lot of money, even for 1937. For the new house he’s having built, Tokumaru is asked by the contractor to fork over 500 yen (that is, more than his daughter makes in a year) over and above the price originally agreed to, because the costs of building materials have gone up. Worst of all, Tokumaru, who’s been making plans on the assumption that he’ll keep working until age 65, has been hearing rumors at his company that the retirement age will soon be changed to 55… a milestone he’s already reached. The reason I felt uncomfortable was because all this economic misery and corporate chicanery suggests 2016 America as much as Depression-era Japan. Without many changes, this could easily be adapted into a contemporary American movie… if Hollywood would ever have the guts to make a picture this downbeat about a modern “salaryman.” The film also made me uncomfortable in another sense, because it now exists only in very fragmentary form, and is thus impossible to evaluate properly. But then the narrative takes an even darker turn. 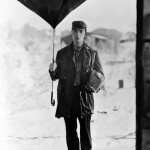 During a thunderstorm, Tokumaru collapses and loses consciousness. 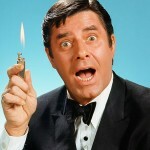 In his dreams, he’s not been fired at all, but promoted, and all his desires for himself and his family have come true. After he wakes up, Tokumaru believes the dream to be real, and when he goes to the office, he sits in his boss’ chair and invites all his co-workers out to lunch to celebrate. The situation becomes so embarrassing that his daughter has to be called to come to the restaurant and bring him home. 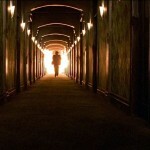 The film suffered a fate as demeaning as that of its protagonist. 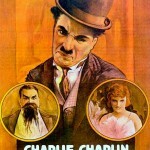 Re-released after the war, it was edited in such a way that the dream sequence was presented unironically as real, and the movie’s tragic ending was thus transformed into a happy one. (Think of Murnau’s The Last Laugh.) Uchida was, of course, furious at the changes, and refused afterwards to allow this mutilated version to be shown, though the original version, apparently, no longer exists. As a compromise, it was edited yet again, with printed intertitles describing the events of the original film’s deleted sections, and the director approved this version. The pathos of Tokumaru’s mad delusion is thus completely excluded, except for one brief scene. Missing, too, is the climactic scene at the restaurant, in which the unemployed young man, Kato, gives a bizarre speech condemning the sick old man as a relic of a dying age. (This passage has only been preserved in the published screenplay.) Peter B. 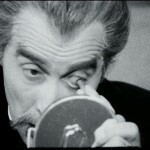 High, author of The Imperial Screen – the definitive book about the militarization of Japanese cinema during this troubled era – describes this monologue as exhibiting “the lurking spirit of Nazism.” This part, too, I would very much like to have seen and evaluated for its contemporary resonances… if the movie had not been, like its hero, broken. Earth has an origin story that is – as one of the series’ curators, Alexander Jacoby, remarked when he introduced the film at its MOMA screening –nearly too good to be true. Nikkatsu, the studio to which Uchida was under contract at the time, turned down his idea to adapt Takashi Nagatsuka’s 1913 novel. Thereafter, for a whole year, Uchida, while working on officially-sanctioned projects during the week, secretly filmed the unauthorized Earth on weekends, including location shooting in northern Japan. By the time Nikkatsu’s executives found out about the clandestine film, they couldn’t suppress it for fear of losing face with those studio employees who had worked on it, or indirectly assisted in its making. 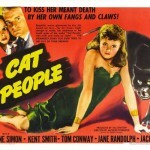 So the studio reluctantly released it and it became a big hit, later voted the best film of 1939 by critics. Earth is, in fact, the ultimate expression of Uchida’s tendency toward hard realism, though even here, a certain Romantic stylization is apparent. It’s probably the darkest (literally) movie about farming I’ve ever seen: call it rural noir. The interior shots of the family’s house are very dim and hard to see, and many of the outdoor shots occur at dawn, dusk or night. The protagonist, Kanji (Isamu Kosugi), a prematurely aging tenant farmer, is also dark, as his face always seems to be covered in grime that he cannot wash off. There is darkness in Kanji’s soul as well, as he harbors a bitter grudge towards his father-in-law. The old man, who lives with Kanji and his daughter (Akiko Kazami) and young son, is not only one more hungry mouth to feed, but is too proud and too senile to submit willingly to the authority of his distracted son-in-law. His increasingly unruly antics end with him accidentally burning down Kanji’s house. When Kanji refuses to forgive the old man for this blunder, he’s ostracized by the community (though if a relative of mine burned down my house, I’d be ticked off, too). Some commentators have suggested that Kanji’s hostility towards the old man is actually misdirected rage, that he’s really angry at the owner of the land – or rather, the whole tenant-farming system – and taking it out on his father-in-law. This theory makes a lot of sense. Though seemingly benign (she accedes to every request Kanji makes), the landowner still takes most of his rice crop as rent, leaving him and his family with little. It’s been written that Uchida’s narrative eliminates most of the original novel’s left-wing content, but I still sensed some strongly leftish sentiment. 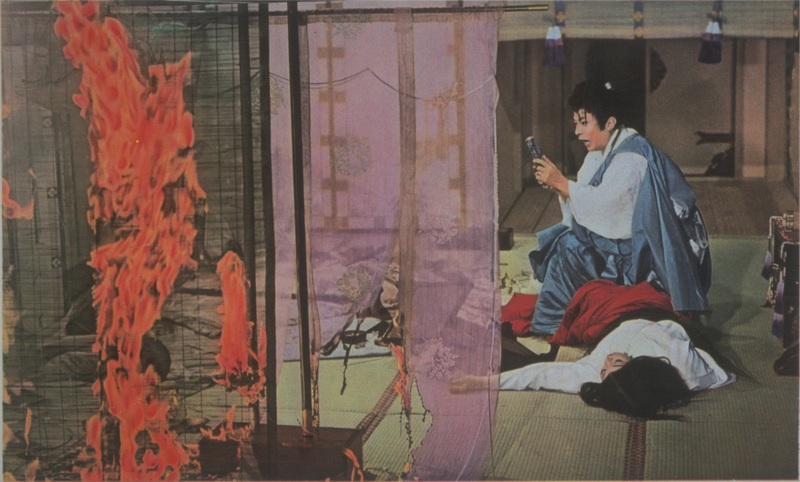 While Kanji’s hut is burning, for example, the villagers, at first trying to control the blaze, suddenly decide that the house is a lost cause and turn their attention to the landowner’s house, which is also in danger of burning down, as it is considered much more important. The scene says everything that need be said about the priorities of this still-feudal world. Earth, despite its current fragmentary state (its last reel is missing), is a flawed masterpiece. 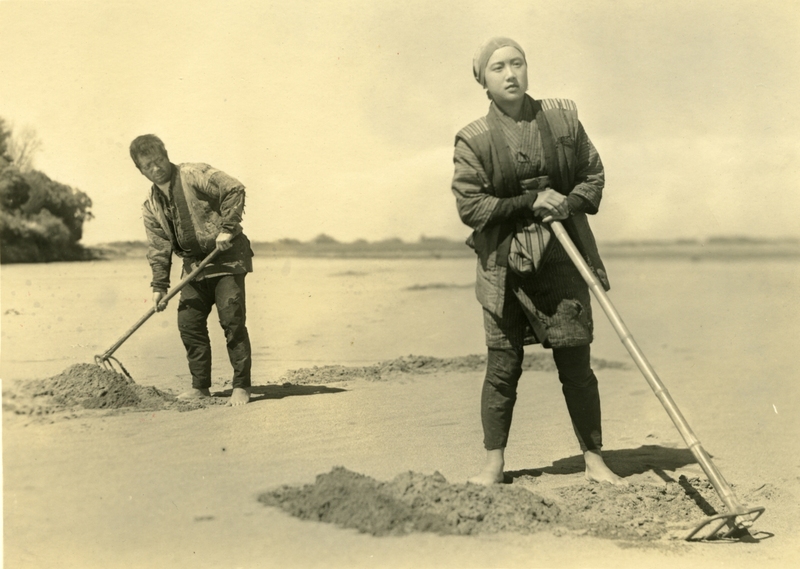 Though not a classic on the order of Ray’s Pather Panchali – which it resembles – the film is “the summation of all that the Japanese cinema had come to represent in the 1930s,” according to film scholar Donald Richie, one of whose books first brought Tomu Uchida to my attention. Now considered a classic, A Bloody Spear at Mt. 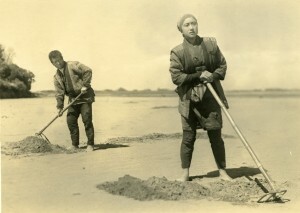 Fuji was Uchida’s successful comeback following his decade-and-a-half absence from Japan, during which he had attempted in vain to make films in Manchuria for the wartime Japanese government, and then in China, as a kind of atonement, had tried, again unsuccessfully, to make films for the Communists. (The frequently-claimed reason for his long absence – that he was held for years as a prisoner of war by the Chinese – appears to be untrue.) Three of Uchida’s old buddies, directors Hiroshi Shimizu, Daisuke Ito and Yasujiro Ozu, were all credited as “advisors” to the production. Though they may well have had a hand in the script, the final work reflects Uchida’s characteristic themes and obsessions. A young, naïve, but intelligent samurai with a weakness for alcohol, Sakawa (Eijirō Kataoka), goes on a journey to deliver a precious family heirloom, accompanied by his loyal retainer, Genta (Daisuke Kato), and his equally loyal, middle-aged spear carrier, Genpachi (Chiezō Kataoka). Along the way, the trio encounters a collection of colorful period-film types, through which the narrative cleverly accumulates a number of thematic doubles. A poor man suspected by a government spy of being a notorious thief is doubled by the real thief, who is disguised as a traveling priest. The poor man’s daughter, sold many years ago into sexual slavery (and whom he is attempting to buy back), is doubled by a beautiful female traveler who is being similarly sold by her father in the present. Even Genpachi is doubled by a little orphan boy tagging along with him who, aspiring to be a spear-carrier himself when he grows up, imitates the man’s gestures and walk. Up until the last ten minutes, the film plays like a period-film version of one of Heinosuke Gosho’s gentle tragicomedies of the 1950s, such as An Inn at Osaka (1954). But then, with little warning, the movie suddenly goes all Kurosawa. A bunch of snobbish samurai at a roadside tavern find Sakawa sharing a drink with Genta and, disgusted at this breach of samurai decorum, launch an epic battle against them and Genpachi. The skill with which Uchida manages this unexpected shift in tone, and the clarity and precision with which he stages the final battle, are hallmarks of the director’s style. Uchida was one of Japan’s finest action directors. (Perhaps only Kurosawa, among his countrymen, was his superior in this regard.) Yet, through all the mayhem in his films, as in this case, he always sought to elucidate the mysteries of human behavior within the context of an oppressive society – including how a gentle man like Genpachi could, under certain circumstances, become a raging, murderous beast. 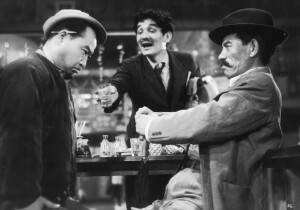 Daisuke Kato (left), Jun Tatara and Eijiro Tono in Twilight Saloon. Japan. 1955. Directed by Tomu Uchida. This movie, which depicts, on a single, stage-like set, a seedy Tokyo tavern on a particularly eventful night in the early postwar era, has sometimes been compared to Casablanca . I think a more useful comparison would be to Robert Altman’s classic 1970s films. 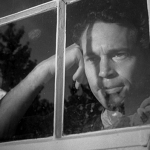 (In 1955, when this movie was released, Altman was still in the Midwest, churning out industrial films.) Like those later American films, Uchida here is interested in depicting a lively but closed community, with its own folkways and taboos. I think it’s significant that this picture was completely shut out of the Kinema Junpo critics’ list of the Top 30 films for its year. I suspect that reviewers at the time thought it a failure because it didn’t have a strong main plot, but this lack of a solid narrative center seems to me its most charming quality. The film moves swiftly and seemingly randomly from one patron’s story to another, easily mixing melodrama, low comedy and satire. This is, in fact, one of Uchida’s most amusing films. From the “radicals,” who are more interested in singing and drinking than making revolution, to the ex-militarist (Eijirō Tōno) reminiscing with his old service buddies about the past “glories” of the war, the film pokes fun at the whole political spectrum of its time. The most respected character in the place is the bohemian artist Umeda, played by Uchida regular Isamu Kosugi, in his final film for the director. This character introduces into Uchida’s films the recurring theme of guilt. Remorseful for having placed his art at the service of the military dictatorship during the war (as was Uchida himself for doing the same thing), Umeda no longer paints. He’s content to drink, observe the passing show and, occasionally, lend a helping hand, and money, to a young person in trouble. There’s a delightful scene, which feels ad-libbed, in which Umeda, for the whole tavern’s amusement, performs Bizet’s Toreador Song, using a cape and another patron in the role of the bull. The drawback for filmmakers who are “ahead of their time,” as Uchida was with this work, is that they usually get neither box-office success nor critical respect when they most need them. But now that we’ve finally caught up, so to speak, with Uchida, we can enjoy this minor classic. This nearly five-and-a-half-hour epic may well be Uchida’s best showcase for his genius as a storyteller. It really has to be, because the narrative is preposterous in concept and ridiculous in its details, including all manner of unlikely coincidences and impossible escapes. But these seeming faults matter as little as would the ludicrous libretto of a great opera, and for the same reason. 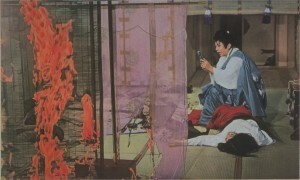 Although the rambling plot is carefully set within a recognizable historical era – the mid-19th Century, when the Tokugawa Shogunate was disintegrating – it functions not as a credible reflection of “real life,” but as a kind of crucible within which the dark fates of its strangely compelling characters, male and female, are combined and fused. 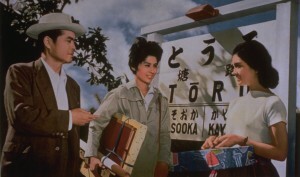 The narrative begins with Ryunosuke meeting by chance a religious pilgrim at the Great Bodhisattva Pass (the meaning of the film’s original Japanese title). 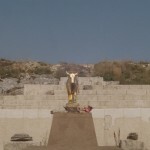 The old man is on his knees, praying, and the warrior, without warning, unsheathes his sword and kills him. This first inexplicable action leads inevitably to a series of actions resulting in a vast pileup of corpses. This theme is made even more explicit via the character of his antagonist, the young swordsman Hyoma (Kinnosuke Nakamura). The brother of a man whom Ryunosuke kills early in the story, Hyoma is obsessed with revenge until, near the end of the narrative, he transcends his rage and achieves a kind of Enlightenment. He no longer hates Ryunosuke; he now seeks to kill him solely to put him out of his earthly misery. This change of heart may raise a smile from Western viewers, since Hyoma’s objective remains the same: Ryunosuke’s death. But to Japanese audiences, the “why” is often more important than the “what,” and Uchida makes Hyoma’s moral redemption both believable and meaningful. This is not the greatest trilogy in Japanese cinema. That would be Masaki Kobayashi’s The Human Condition (Ningen no Joken, 1959-1961), which, by contrast, presents us with a hero who feels too much. But Uchida’s expert command of this incredibly complicated story and its complex themes, as well as of his enormous cast, is very impressive. This film’s widescreen color location cinematography (by Shōei Nishikawa) is so dazzling that it’s difficult to believe that it was released only three years after A Bloody Spear at Mt. Fuji, whose visual style harkens back to the 1930s. But though the onscreen landscapes (shot on location in the northern island of Hokkaido) that Uchida presents are a feast for the eye, other aspects of the movie – plot and character, for example – are a bit problematic. As Jasper Sharp has pointed out in his Midnight Eye review, this film – dealing with the discrimination and cultural destruction faced by the indigenous Ainu people of Hokkaido – strongly recalls, in its themes and even in its visuals, the liberal “anti-Westerns” Hollywood released in the 1950s and 1960s. Surely an analogy can be made between the situation of the Ainu, whose culture and economy have been steamrollered by the encroaching Japanese since at least the 19th Century, and the continuing travails of Native Americans. 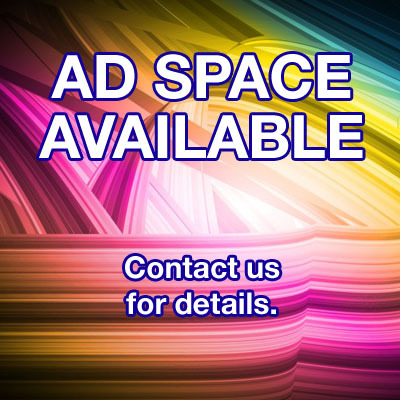 But the movie also exemplifies many of the flaws of the Hollywood subgenre it evokes, particularly the difficulty it seems to have in getting inside the minds and hearts of the people it is championing. 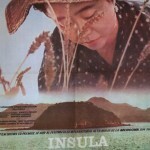 (My experience of the film wasn’t helped by a print with unidiomatic English subtitles, such as “I have an information for you.”) One could almost accuse the movie, ironically, of Orientalism in its success in detailing the colorful customs and folkways of the Ainu – Festival of Lakes and Forests is the literal translation of the film’s Japanese title – and its (relative) failure to sufficiently explore their inner lives. 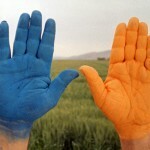 The film, it should be noted in fairness, has many fine things to recommend it besides beautiful photography. These include an all-too-brief performance by lovely Ineko Arima as the divorced Ainu wife of a Japanese anthropologist (who “collected” her like a native artifact), and a dynamic Brandoesque turn by future superstar Ken Takakura, as a rebellious Ainu Robin Hood figure. Perhaps I need to see the movie again to judge it fairly. But this was the film in the entire Uchida series that I most looked forward to seeing, and it was almost the only one that left me hungry for more. Portraying the real-life story that the puppet theater playwright Chikamatsu adapted for his classic play, The Courier for Hell (Meido no hikyaku), this movie boasts vibrant, sumptuous color and brilliant camerawork: it’s a perfectly crafted piece. Yet the filmmaker’s real achievement here is in revealing the rottenness and cruelty behind the rich, glamorous world of 18th Century Osaka that he recreates. Chubei (Kinnosuke Nakamura) is the young adopted son of a no-nonsense businesswoman (Kinuyo Tanaka) who runs a courier service. Employed by this woman as a humble courier – “a merchant’s money is a samurai’s sword,” she ominously tells him – he waits on the distant day when he can inherit the business and marry the woman’s daughter. Dragged, literally, to the city’s licensed pleasure quarters by his bullying friend Hachi (Kurosawa regular Minoru Chiaki), the virginal Chubei falls head-over-heels for the beautiful, compassionate courtesan Umegawa (Ineko Arima). He desperately wants to buy out her contract to the brothel, but lacks the cash to do so – except, of course, when he’s carrying other people’s money as a courier. 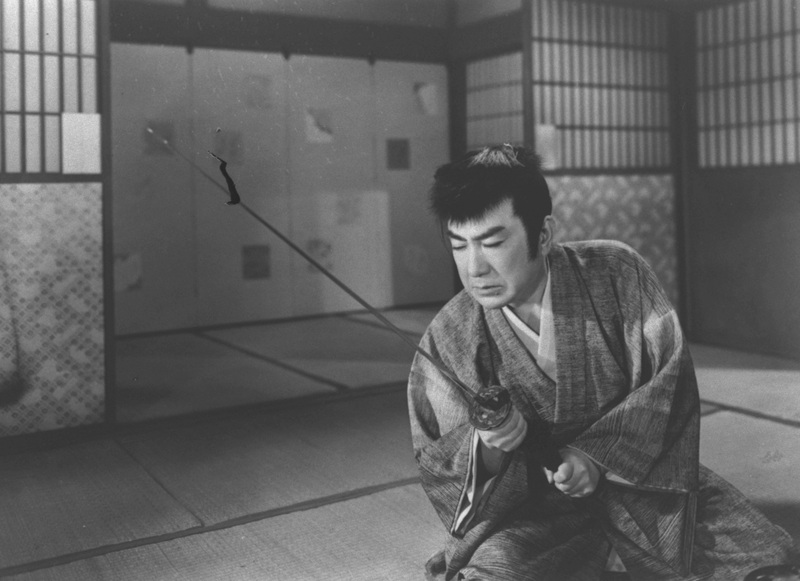 Uchida’s brilliant strategy is to introduce Chikamatsu (Chiezō Kataoka) as a character in the narrative. As a celebrity playwright respected by all, he is very much in “the floating world” but not quite of it. He’s scornful of the greed and exploitation he sees, yet for the sake of his art, he himself exploits, through drama, the suffering these vices cause. And the character is sometimes used wittily by Uchida. Just after the lovers have fled Osaka, a serving maid asks Chikamatsu if they have, as she’s heard, committed double suicide, and he chides the woman for getting ahead of the plot. The final scene in the movie is thrilling. The shot begins with a closeup of Chikamatsu sitting at the rear of a theater. Then the camera pulls back to show the audience rapturously watching his new play (The Courier for Hell, of course), until we finally reach the stage, on which we see, in closeup, a remarkable puppet performance, movingly evoking a scene in the lovers’ tragedy that never actually happened in real life. Then there’s a great, final closeup in which Kataoka as Chikamatsu looks straight into the camera and at us, his eyes seeming to burn with indignation at our sinful world, as the image fades. Uchida portrays Chikamatsu as a god-like figure, unable to protect humans from their folly, but fully capable of redeeming their lives through art. One of Uchida’s very greatest works, Killing in Yoshiwara is compelling but extremely painful viewing, for we watch helplessly as a good but naïve man destroys himself. 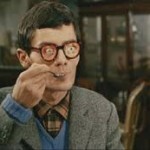 The plot suggests Shakespeare’s Timon of Athens crossed with Jean Renoir’s La Chienne. 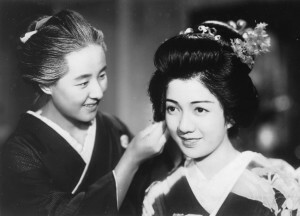 But as masterly as Renoir’s film was, he failed to summon as much audience empathy for his hero as Uchida does for his. The narrative begins with a great origin story, like a tragic version of Moses. An abandoned infant with a hideous purple birthmark on his cheek is discovered by a childless couple, a short sword and a brief document the only evidence of his samurai origins. Jiro (Chiezō Kataoka) grows up to be a wealthy but humble silk manufacturer. All his employees love him, despite the grotesque birthmark. The only thing missing from Jiro’s life is a wife to bear him an heir to carry on the business… and to relieve his loneliness. One of Jiro’s business associates, acting as a go-between, arranges his offer of marriage to a prospective bride – a homely, aging, but respectable woman. Before she can give a definite answer, though, the businessman offers to treat Jiro (who’s almost certainly a virgin) to an evening at Tokyo’s licensed pleasure quarter, Yoshiwara. There he meets the attractive but terrifying empty Tsuru (Yoshie Mizutani), a common streetwalker working in the brothel as a serving maid, and the only woman in the place willing to entertain him. When they are left alone together, she actually kisses the awful birthmark, saying “I’ve kissed it all away.” No wonder the poor guy is hooked! But Tsuru is incapable of love. Her only motivation for seducing the rich man is to exact revenge on the real courtesans and on her employers, all of whom despise and humiliate her. What makes the story a tragedy rather than a mere melodrama is that even though Jiro foolishly spends a fortune from his savings to advance his new mistress’ career, he never loses his basic decency. When a natural disaster wipes out the supply of silk upon which his business depends, he spends a second fortune to keep his suppliers from starvation. This film was written by Yoshikada Yoda, Kenji Mizoguchi’s great scriptwriter, but there are many masterful touches Uchida employs that were almost certainly not part of Yoda’s script, good as it is. For example, there’s a marvelous scene when Tsuru, under Jiro’s sponsorship, parades through the town as the newest courtesan. She is haughty and smiling and he, walking beside her, looks proud and pleased. But in the lower right-hand corner of the frame, a little girl is walking along, staring up at them, utterly amazed at the behavior of these foolish adults. I have a confession to make here. I usually strongly disdain what I call the “one-man army” swordfighting scenes so frequent in Japanese period films. This is when a lone swordsman holds off a whole city’s worth (or so it seems) of adversaries – even when they’re surrounding him – and slices and dices them efficiently, like so many slabs of prime rib. But the climax of this film is an outstanding exception to this cliché. The action is weirdly plausible because Jiro, now crazed, is acting out the rage and pain that had been building up in him long before he’d had the misfortune of meeting Tsuru, giving him almost superhuman strength. But the beauty that Uchida evokes – cherry blossoms are gently falling as the merchant attacks his enemies – is just about the only thing that makes it bearable. Killing in Yoshiwara is a singularly cruel masterpiece. This grim fairy tale represents the polar opposite from the stylized realism that Uchida mastered in the 1930s with Police Officer and Earth, and continued to explore in his 1950s movies, like Bloody Spear and The Outsiders. In ancient Japan, Yasuna (Hashizo Okawa) is a disciple of the elderly astronomer, Yasunori. The astronomer’s adopted daughter, Sakaki (Michiko Saga), has fallen in love with Yasuna. 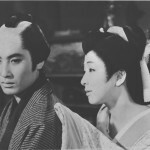 Yasunori, however, is murdered by order of his wicked wife (Sumiko Hidaka) and her ambitious lover. The imperial court demands that Yasunori’s prophetic scroll be produced, but it has vanished, and Sakaki is falsely accused of having stolen it. She and Yasuna are imprisoned by Yasunori’s widow (the real thief) and brutally tortured, and Sakaki dies of her injuries. Poor Yasuna goes mad, accidentally sets the place on fire, killing the evil widow, and vanishes into the night. But as soon as Yasuna goes nuts, so does the movie. The young man, who thinks Sakaki’s still alive, meets Kuzunoha, her identical twin sister (also played by Ms. Saga) and when he starts calling her Sakaki, she goes along with the deception. Then a female fox (Ms. Saga again), who is actually not at all mad, falls in love with Yasuna. Since the magic fox is capable of assuming human form, she disguises herself as the deceased Sakaki (or the living Kuzunoha: it’s not clear which), and the couple bears a half-fox, half-human child together. If you’re thoroughly confused by now, it doesn’t matter, because plot coherence and plausibility are totally beside the point here. Uchida has a field day mixing and matching various traditional Japanese cultural forms to tell his story – folk tales, Kabuki, Bunraku, Rakugo and Noh among them. In scene after scene, the director delights in creating anti-realistic imagery, theatrical-looking artifice and clever bits of business. 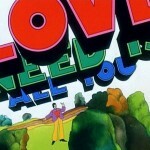 If Michael Powell had seen this movie, he would have been green with envy. But underneath the charming surface of the narrative, there’s a bleak subtext. Except for Yasunori’s widow, all the evil characters triumph, while the good ones are destroyed, damaged or powerless in the end. Beyond all the feverish fantasy, this, it appears, is Uchida’s “realism”: art, like a madman’s delusions, is only a palliative in a world that’s always been incorrigibly cruel and corrupt. I doubt if any single work could possibly have utilized all of Tomu Uchida’s diverse strengths as a moviemaker. 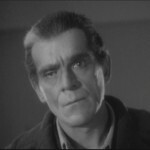 But the very dark thriller, A Fugitive from the Past, probably comes closer to that ideal than any picture the director ever made. It was the most critically-esteemed film of Uchida’s postwar career, and in recent years it has become by far his most admired work, selected by critics in 1999 as the third-greatest Japanese film of all time. The story of a man in postwar Japan whose involvement in a robbery-murder results in a complex web of crime and guilt, the work may be considered flawed by the near-total absence of the director’s customary humor and cinematic playfulness, replaced here by a dark, somber irony. For that reason, this very long movie is a bit tough to sit through at times. But it remains Uchida’s strongest variation on his recurring themes of Karmic guilt, retribution and redemption. This was the director’s first black-and-white movie since 1957 – it was shot on 16mm and blown up to 35mm to achieve a gritty, “dirty” look – and the cinematography, by Hanjirō Nakazawa, is amazing to behold. As commentators have noted, Uchida, who was in his middle sixties when he made this movie, incorporates here the influence of Japanese New Wave filmmakers half his age, such as Nagisa Ōshima and Shōhei Imamura. 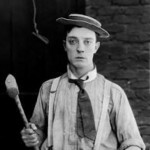 Having seen Police Officer, however, I now realize that, in going New Wave, he was merely updating the bold, kinetic, sometimes expressionistic techniques of his own 1930s films for a modern audience. 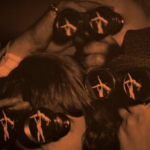 For example, several times in the narrative, at moments of highest intensity, the cinematic image suddenly “goes negative” for several seconds – think of the thermographic photos on the cover of the Rolling Stones’ album, Emotional Rescue – a visual motif that could have seemed pretentious or odd, but which works beautifully. 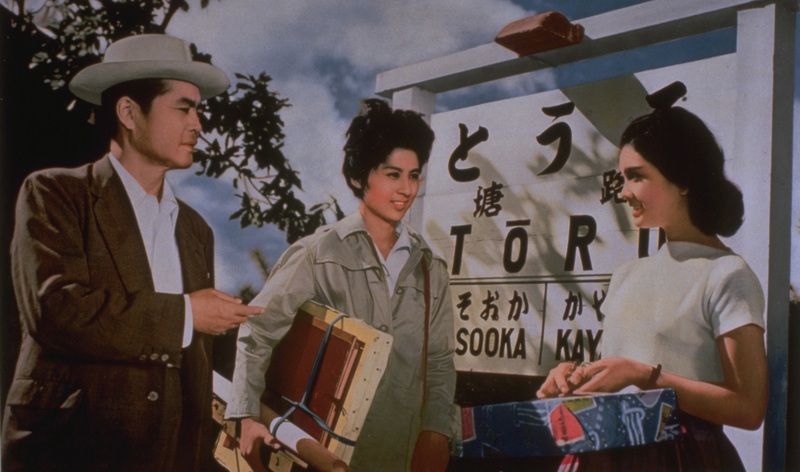 The film contains two of the strongest performances in the history of Japanese Cinema: Rentarō Mikuni as the ambiguous yet sympathetic fugitive of the title, Inukai, and Sachiko Hidari as the truly strange and frightening innocent, Sugito Yae. Add to all this an interesting music score by future synthesizer king Isao Tomita, and several fine supporting performers, including character actor Junzaburo Ban and the young Ken Takakura (he became a superstar in Japan later that year, with Teruo Ishii’s Abashiri Prison), and you have what is surely one of the finest Japanese films ever made. Overall, of all Japanese directors whose work I know at all well, I would now put Uchida in sixth place, just below the “big four” masters – Kurosawa, Ozu, Mizoguchi, Mikio Naruse – and Masaki Kobayashi (The Human Condition, Harakiri, Kwaidan). If a ranking of “sixth best” doesn’t seem very impressive, keep in mind that I am rating him above literally dozens of wonderful directors, including contemporaries such as Yamanaka, Gosho, Kinoshita, Ichikawa, Imai, Shindo, Honda, Imamura and Teshigahara. For in the final analysis, the quality that puts Uchida in the same league as artists like, say, Kurosawa and Kobayashi – and which many of his worthy colleagues, however talented, didn’t possess – is a tragic sense of life, and an ability to communicate that vision cinematically. The phenomenon of good people who do truly awful, destructive and self-destructive things is a mystery that sages and saints have been trying to fathom for millennia. It’s a mystery that obsessed Uchida, too, but few film artists in Japan – or anywhere – have managed to explore this dilemma with as much depth and passion as he.